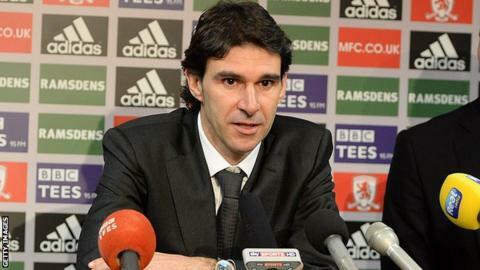 Middlesbrough head coach Aitor Karanka says an away trip to Leeds is a great way to start his spell on Teesside. The former Real Madrid assistant boss, 40, takes charge of his first game 10 days after being appointed by Boro when they visit Elland Road on Saturday. "I'm happy my first match is against a big club with large support that will hopefully mean we have a lot of our fans there too," he told BBC Tees. "Hopefully the fans are as excited as I am. This is a new era - a fresh start." Backroom changes have been made, with with coaches Mark Proctor and Stephen Pears leaving the club earlier this week. Aitor Karanka was Jose Mourinho's assistant for three years at Real Madrid. He is the second of Mourinho's coaching staff to become a Championship boss. Brendan Rodgers left Chelsea to take over at Watford. He then had a short spell at Reading before winning promotion with Swansea. Meanwhile, youth coach Jamie Clapham has been promoted to work with the first-team staff, alongside new fitness specialist Carlos Cachada. "We've had 10 days of good training and now we can test how much the players have taken on from us," Karanka said. "It's going to be a step-by-step, slow-building process because I won't change too much too fast. "The squad have been working very hard doing some double sessions. "I think it's been important to do that so I could get across my philosophy and methodology - they seem to be enjoying it."